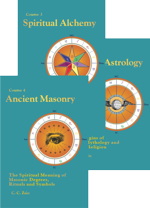 THE principles and steps to be taken in erecting a horoscope for any time and place are explained in Chapter 7 (Serial Lesson 86). There are certain short cut methods that may be used under common circumstances, and alternate methods which some find make the work easier. These will be explained and used in some of the example charts. Church of Light Student’s Charts were designed to facilitate taking each of the essential steps in erecting a chart explained in Chapter 7 (Serial Lesson 86) in its proper sequence, and by presenting a blank line to be filled in following printed instruction as to the entry to be made on it to make it unlikely any required calculation would be overlooked. On a Student’s Chart there are thus 28 lines that may be filled in. As the chart was designed to take care of any contingency in chart erection, commonly a few of the lines, which do not apply to the particular chart under construction, are left blank. 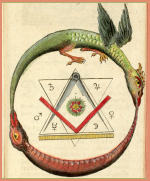 But for facility in learning to erect a chart according to the Hermetic System it is essential that the student know precisely what entry should be made on each of the 28 lines. For purposes of ready reference, on each of the 10 Student’s Charts here reproduced a number has been inserted before each of these lines. 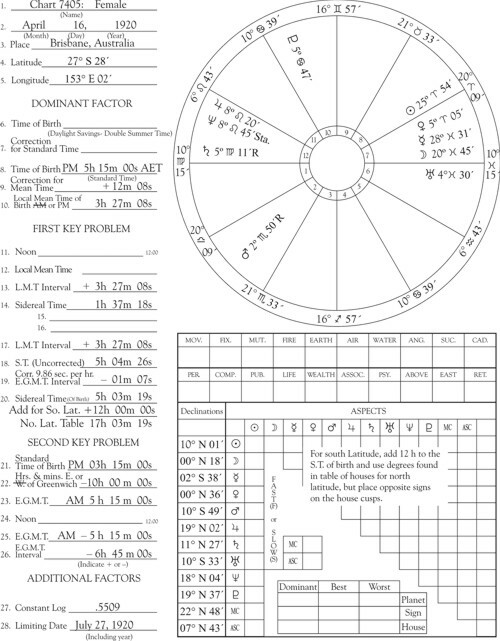 Line 1: Write in the name of the person, corporation, city, nation, planetary cycle or horary question for which the chart is erected. Line 2: Write in the month, day of month, and year of birth. Line 3: Write in the name of the place of birth. Line 4: Write in the latitude of the place of birth. Line 5: Write in the longitude of the place of birth. The latitude and longitude of a place may be ascertained from an atlas or map. Goode’s School Atlas has an index giving the latitude and longitude of over 30,000 places in the world. Dernay’s Longitudes and Latitudes throughout the World (except the United States) gives the precise latitude and longitude of 5,000 cities distributed through 187 countries, colonies and dependencies; and Dernay’s Longitudes and Latitudes in the United States gives the precise latitude and longitude of all county seats, and all cities with 2,500 inhabitants or over in the United States. For a precise chart, the exact latitude and longitude of the place for which it is erected must be ascertained. Line 6: Unless some other kind of time than Standard or Local Mean Time was used in timing the birth, line 6 is left blank. If Double Summer Time was used (as in mid-summer in England during World War II) this should be noted in entry of time on line 6. If Daylight Saving or War Time was used (as throughout the U. S. from 2:00 A.M., Feb. 9, 1942, to 2:00 A.M., Sept. 30, 1945; and during the summer only both before and since in various regions), it should be entered on line 6. Line 7: Unless some other kind of time than Standard Time or Local Mean Time was used in timing the birth, line 7 is left blank. If Double Summer Time was used, write minus 2h on line 7. If Daylight Saving or War Time was used, write minus 1h on line 7. Line 8: If the birth was timed by Standard Time write it on line 8 as so many hours and minutes A.M. or P.M. If the birth was timed by Double Summer Daylight Saving, or War Time, subtract line 7 from line 6 and write the Standard Time thus found on line 8. If the birth was timed by Local Mean Time (as was usually the case in Britain before 1880, and in the U. S. before November 18, 1883) line 8 is left blank. Every 15° of longitude east or west of Greenwich is called a Standard Time Meridian marking the middle of a different time zone. In the U. S. the middle of the Eastern Standard Time Zone (EST) is 75° west, the middle of the Central Standard Time Zone (CST) is 90° west, the middle of the Mountain Standard Time Zone (MST) is 105° west, and the middle of the Pacific Standard Time Zone (PST) is 120° west. After the Standard Time written on line 8 should be written the abbreviation for the Standard Time Zone within which birth took place. Line 9: When the birth was timed by Local Mean Time line 9 is left blank. Otherwise find the difference in °s and ′s between the longitude of birth and the Standard Time Meridian of the time zone within which birth took place. Multiply the °s so found by 4 and call the product minutes of time. Multiply the ′s so found by 4 and call the product seconds of time. Write the minutes and seconds so found on line 9. If the longitude of birth was east of the Standard Meridian precede this time interval with a plus sign. If the longitude of birth was west of the Standard Meridian precede this time interval by a minus sign. Line 10: When the birth was timed by Local Mean Time, leave lines 6, 7, 8 and 9 blank and merely write on line 10 the time of birth. Otherwise, if line 9 is plus add to line 8, and if minus subtract from line 8. 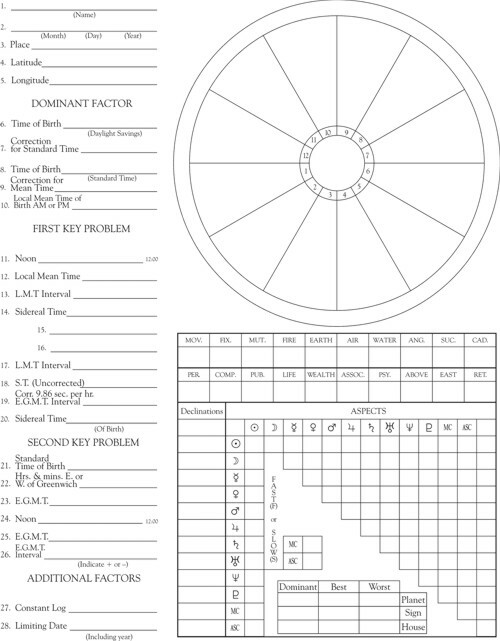 Write the sum or difference on line 10 crossing out A.M. or P.M. to indicate if the birth was before or after noon. Line 11: Nothing should be written on this line. The figure 12:00 signifies noon on the day of birth. Line 12: If line 10 shows the LMT of birth to be P.M. line 12 should be left blank. If line 10 shows the LMT of birth to be A.M. the hours, minutes and seconds so shown should be written on line 12. Line 13: If the LMT as shown on line 10 is A.M., subtract the hours, minutes and seconds on line 12 from the 12h 00m 00s (noon) printed on line 11, and write the hours minutes and seconds so found on line 13 with a minus sign preceding them. If the LMT as shown on line 10 is P.M., merely copy the hours, minutes and seconds so shown on line 13 with a plus sign preceding them. 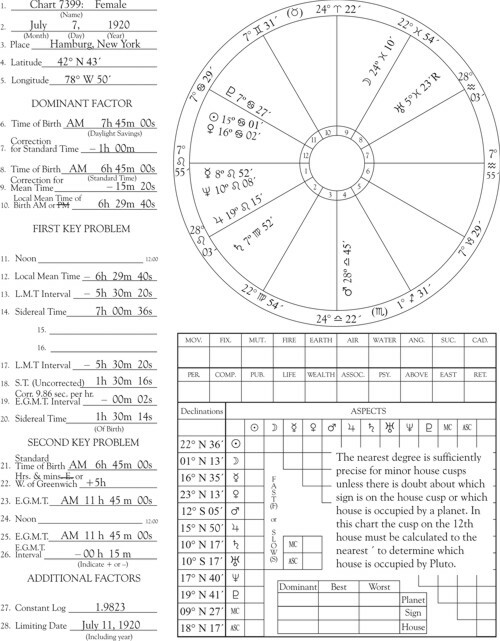 If a midnight (zero hour) ephemeris is used, before making entry on line 13 add 12 hours (the time interval from midnight to noon) to the hours, minutes and seconds otherwise to be entered. Line 14: From an ephemeris for the day of birth copy on line 14 the hours, minutes and seconds of sidereal time there given. Line 15: If line 13, and therefore line 17 is minus and greater than line 14, in order to subtract line 17 from line 14, 24h should be written on line 15. Otherwise line 15 should be left blank. Line 16: Line 16 is left blank unless it becomes necessary to write 24h on line 15. In these instances the hours on line 15 should be added to the hours, minutes and seconds of line 14 and their sum written on line 16. Line 17: Copy the hours, minutes and seconds of line 13, preceded by their plus or minus sign, on line 17. Line 18: Add or subtract, as the plus or minus sign indicates, line 17 to or from line 14 (or from line 16 if an entry on it has been found necessary). Write the hours, minutes and seconds so found on line 18. Line 19: If a chart is desired with house cusps within only one degree of precision, which is close enough for delineating, but not precise enough for calculating progressed aspects involving M.C. and Asc., line 19 may be left blank, and line 18 merely copied on line 20. 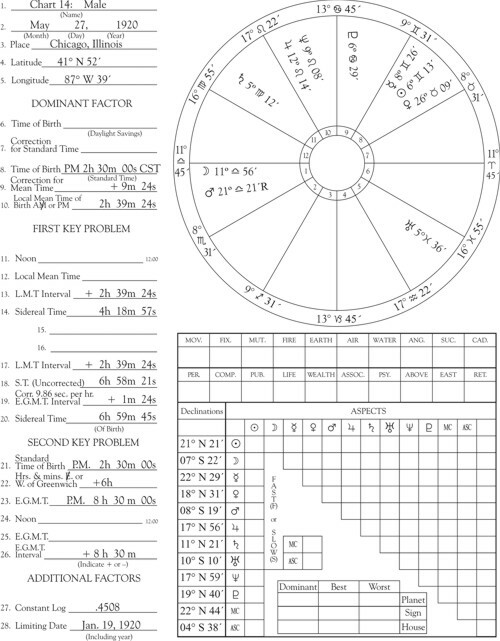 But if a chart with all house cusps calculated to the precise ′ is desired (see above: Correcting House Cusps for Latitude of Birth), before making entry on line 19 it is first necessary to ascertain line 26. Line 21: If the birth was timed by Local Mean Time, this time, A.M. or P.M. should be written on line 21. If the birth was timed by Standard Time, the words Local Mean should be crossed out and above them written the word Standard. Then the Standard Time of birth, A.M. or P.M. should be written on line 21. 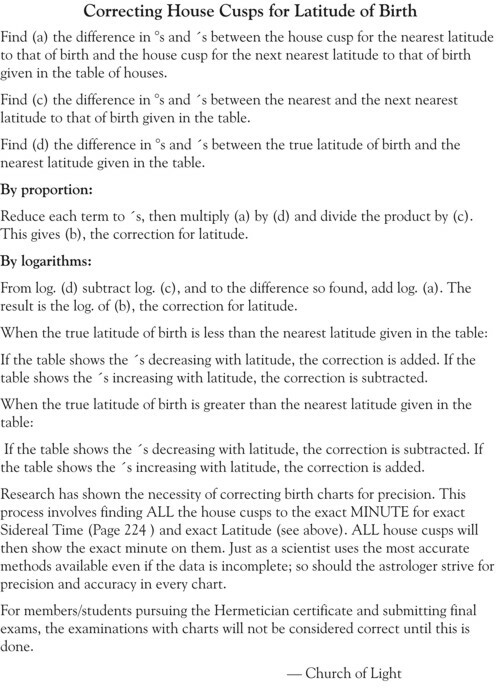 Line 22: If the birth was timed by Local Mean Time the longitude of birth should be converted into hours, minutes and seconds of time by multiplying the °s by 4 and calling the product minutes, and multiplying the ′s by 4 and calling the product seconds. The hours, minutes and seconds so obtained should be entered on line 22. If the birth was timed by Standard Time, merely write the number of hours of the Standard Time Meridian used in timing the birth on line 22. If the birth was in east longitude precede the hours, minutes and seconds on line 22 by a minus sign; if in west longitude by a plus sign. Line 23: As indicated by the minus or plus sign, subtract line 22 from, or add it to, line 21. Designate if the result is A.M. or P.M.
Line 24: Nothing should be written on this line. The figure 12:00 signifies noon of the day of birth. Line 25: If line 23 is P.M., line 25 is left blank. If line 23 is A.M. it is copied on line 25. Line 26: If line 23 is P.M., its hours, minutes and seconds are copied on line 26 preceded by a plus sign. If line 25 is A.M., it is subtracted from line 24 (12h 00m 00s) and the difference in hours, minutes and seconds written on line 26 preceded by a minus sign. The minus or plus Equivalent Greenwich Mean Time interval of line 26 is the interval from which the sign, °, and ′ occupied by each of the ten planets is calculated. Back to Line 19: Each hour of line 26 is multiplied by 9.86 (approximately 10) and the product is called seconds, and the minutes of line 26 are divided by 6 and the quotient called seconds. The sum of the seconds so found, converted into minutes and seconds, is written on line 19 preceded by a minus sign if line 26 is minus, or preceded by a plus sign if line 26 is plus. Line 20: If line 19 is minus, subtract from line 18. If line 19 is plus, add to line 18. Write the hours, minutes and seconds so obtained on line 20. 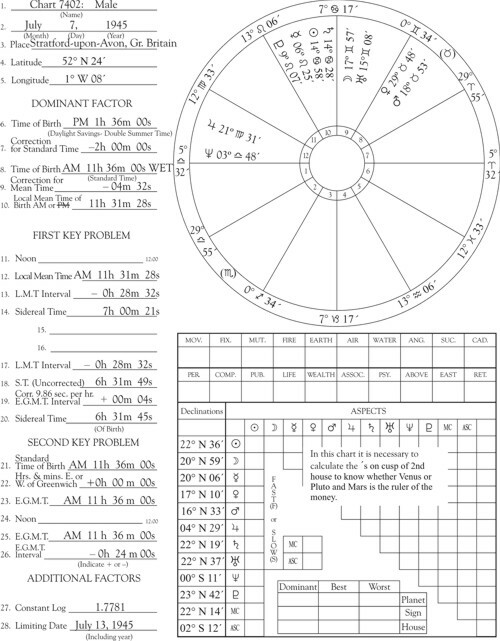 This is the Sidereal Time of Birth from which with the aid of a table of houses the sign, degree and minute on each house cusp of the chart may be calculated. 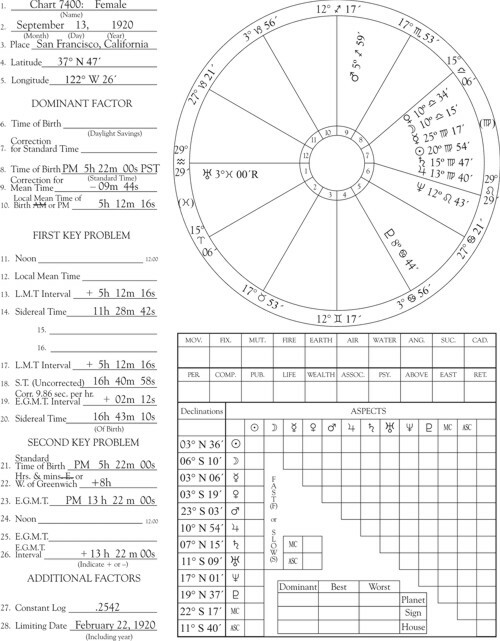 If the chart is erected for a place in south latitude, 12h should be added to line 20, using the degrees thus found, but placing opposite signs on the house cusps. Line 27: Look in a table of diurnal proportional logarithms for the number corresponding to the hours and minutes of line 26. Write this number on Line 27. This logarithm (d) added to the logarithm (a) of the daily motion of the planet on the day of birth gives the logarithm (b) of the °s and ′s moved by the planet during the interval written on Line 26. If line 26 is minus, subtract the °s and ′s so found from the sign, °, and ′ of the planet’s position as given on the day of birth in the ephemeris. If line 26 is plus, add the °s and ′s so found to the sign, °, and ′ of the planet’s position as given on the day of birth in the ephemeris. If the planet is retrograde, add if line 26 is minus or subtract if line 26 is plus. The symbol of the planet should be placed in the chart followed by the °, sign, and ′ so found, which is the zodiacal longitude at the moment of birth. Line 28: If no progressions are to be worked, line 28 may be left blank. If working progressions is contemplated, the hours of line 26 should be divided by 2 and called months, and the minutes of line 26 should be divided by 4 and called days. If line 26 is minus, the months and days so found should be added to the year, month and day of birth. If line 26 is plus, the months and days so found should be subtracted from the year, month and day of birth. The calendar date so found, including the year, should be written on line 28. This Limiting Date (L.D.) is the starting point in calculating the major-progressed positions on any calendar date, and in calculating the calendar date on which any major-progressed aspect is perfect. If the table of houses does not give the house cusps for the precise latitude of birth, find the precise ′ on the Asc. (and other house cusps if desired) for the nearest latitude to that of birth given in the table, then use the CORRECTION OF HOUSE CUSPS FOR LATITUDE OF BIRTH given on page . The precise ′ on the M.C. is the same for all latitudes. Find (a) the difference in minutes and seconds between the nearest and the next nearest Sidereal Time to that of birth (entered on line 20) in the table. This is always 4 minutes in American Astrology tables. Find (c) the difference in °s and ′s between the same house cusps in the consecutive columns within which the True S.T. occurs for the nearest latitude to that of birth. For the M.C. this is always 1° (60′) in Dalton’s, AP, Raphael’s and RC tables. By proportion, reduce each term to ′s, then multiply (b) by (c) and divide the product by (a). This gives (d) the distance the house cusp is from the nearest similar house cusp given in the table for the nearest latitude given in the table. By logarithms, subtract log. (a) from log. (b), and to the difference so found add log. (c). The result is log. (d), the distance the house cusp is from the nearest similar house cusp given in the table for the nearest latitude given in the table. As the difference between log. (a) and log. (b) is the same for all house cusps, when this log. is once found, it can be used in finding any house cusps by adding to it log. (c), which may be different. If the true S.T. (entered on line 20) is less than the nearest S.T. given in the table, subtract (d) from the house cusp given in the table. If the true S.T. (entered on line 20) is greater than the nearest S.T. given in the table, add (d) to the house cusp given in the table. This gives the precise ′ on the house cusp for the latitude given in the table. For their research work during 1948, Elbert Benjamine and W. M. A. Drake undertook to find a more reliable method of timing events by horary astrology. 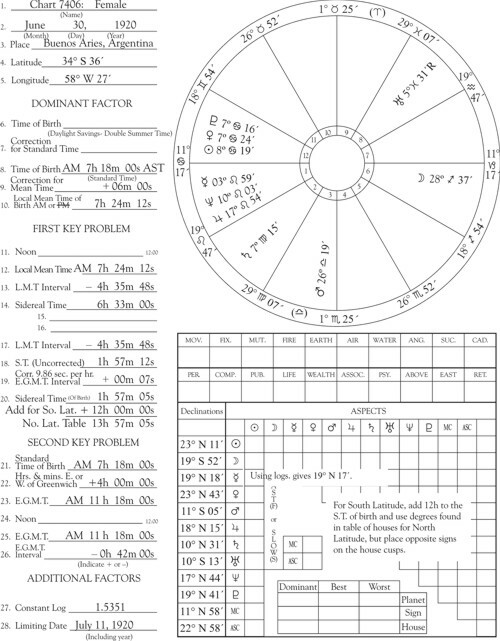 They found, from the analysis of a large number of horary charts in which the time of the indicated event had been recorded after it had transpired, that the trend of a mental event, such as impels the asking of a horary question about something in which one is deeply concerned, may be judged both as to what will happen and when it will occur in most respects as if the chart were elected for the commencement of some physical enterprise. Possibly because the Moon is chief ruler of the unconscious mind, and a horary question is an event deriving from the unconscious mind, the chief difference is that the Moon is co-ruler of the querent. 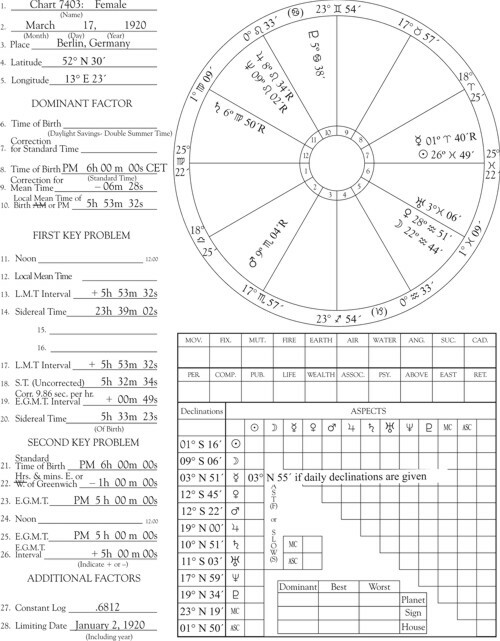 If the question involves some event or condition in the future, the timing of this event includes precisely the same factors which would be present in the birth chart of an individual or a physical enterprise at the time such an event occurred. If the birth chart of an individual, a physical enterprise or a horary question indicates that a particular event will not occur, progressed aspects will not bring it to pass. But if the birth chart indicates the event is probable, it will occur only during the period when there is a progressed aspect involving a planet characteristic of the general nature of the event, and a progressed aspect involving the ruler of each house significantly influenced. Such progressed aspects are effective only while within one degree of perfect. The analysis of a large number of horary charts reveals that an insignificant event asked about—although usually there are also heavier progressed aspects present—may come to pass when each birth-chart or major-progressed significator merely receives a transit aspect. To bring a minor event to pass—although usually there are also heavier progressed aspects present—there must be a minor-progressed aspect and a transit-progressed aspect to each birth-chart or major-progressed significator. To bring a major event to pass, there must be a major-progressed aspect involving each significator, and at the time it happens there must be a minor-progressed aspect and a transit-progressed aspect to one of the four terminals of each essential major-progressed aspect. If, when the question is asked, the significators are within one degree of perfect aspect, even though the aspect is separating, the event indicated by the aspect—which may be favorable or unfavorable—usually occurs, and commonly occurs before the aspect separates to more than one degree from perfect, just as in a natal chart the event attracted by progressed aspect may take place either before or after the aspect is perfect, but only while the aspect is within the one degree limit. The progressed aspects in a horary chart indicate the time and nature of the various events affecting it during its life. Example of P.M. Standard Time when place is East of Central Standard Time Meridian: Chart 14. The meridian for Central Standard Time is 90°W. 90° 00′ minus 87° 39′ (longitude of Chicago) gives the difference as 2° 21′. Multiplying 2 by 4 gives 8m. Multiplying 21 by 4 gives 84s. The sum is 9m 24s. As the place is east of the standard meridian, this 9m 24s must be added to the standard time to get the LMT of birth. As the EGMT Interval is plus 8h 30m, the correction of S.T. is plus 1m 24s. S.T. as given in ephemeris for noon, plus LMT Interval, plus correction, gives the S.T. of birth as 6h 59m 45s. House cusps are calculated for this S.T., and the planets’ positions for the plus 8h 30m EGMT Interval. Example of A.M. Daylight Saving Time when place is West of Eastern Standard Time Meridian: Chart 7399. The nearest S.T. given in Dalton’s table of houses to the 1h 30m 14s written on line 20 is 1h 28m 52s. The difference (b) is 1m 22s or 82s. The next nearest S.T. given in the table is 1h 32m 38s. The difference (a) between this and the nearest is 3m 46s or 226s. In the same column for latitude 42 the cusp of the 12th house is given as 7.4 Cancer. As each tenth degree is 6′ this is 7 Cancer 24. In the column for the next nearest S.T. 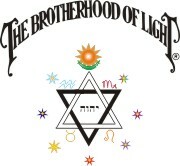 the cusp of the 12th house is given as Cancer 8.1, which is 8 Cancer 06. The difference (c) is 42′. Multiplying (b) 82 by (c) 42 gives 3444. Dividing 3444 by (a) 226 gives (d) 15′ to add to 7 Cancer 24, giving the 12th house cusp in latitude 43 as 7 Cancer 39. The difference between the 12th house cusp in latitude 42 and in latitude 43 is .6 or 36′. The difference (d) between latitude 42:43 and latitude 43 is 17′. The difference (c) between latitude 42 and latitude 43 is 60′. Multiplying (a) 36 by (d) 17 gives 612. Dividing 612 by (c) 60 gives 10′ correction for latitude to be subtracted from 7 Cancer 39, giving the precise 12th house cusp as 7 Cancer 29. Travel of each planet during 15 minutes is calculated and subtracted from its noon ephemeris position. This is one of the rare instances in which the ′s being few a house cusp obtained by direct proportion is 1′ different than the same house cusp obtained by logarithms. Using Dalton’s table of houses, the nearest S.T. is 23h 52m 40s and the next nearest is 23h 48m 59s. The difference (a) is 3m 41s or 221s. The difference (b) between the True S.T. of birth—23h 52m 24s—and the nearest S.T. in the table—23h 52m 40s—is 16s. For the M.C. (c) is 60′, and for the Asc. in latitude 41 (c) is 46′. Dalton’s table of houses gives the minor house cusps to the nearest tenth of a degree, each tenth being equivalent to 6′. On the cusp of the second house the table for latitude 41 gives 7.0 Leo for the nearest S.T. and 6.2 Leo (6 Leo 12) for the next nearest S.T., a difference of 48′. By proportion, multiplying (b) 16 by (c) 48 gives 768. Dividing 768 by (a) 221 gives 3′. By logarithms, subtracting log. of 3m 41s (a) .8140 from log. of 16s (b) 1.9542 gives 1.1402. Adding to 1.1402 log. of 48′ (c) 1.4771 gives 2.6173 which is a little closer to the log. of 4′ than to the log. of 3′. Subtracting both the 3′ obtained by proportion and the 4′ correction for latitude from 7 Leo 00 gives 6 Leo 53. By logarithms it would be 6 Leo 52. The meridian for Pacific Standard Time is 120°W. 122° 26′ (longitude of San Francisco) minus 120° 00′ gives the difference as 2° 26′. Multiplying 2 by 4 gives 8m. Multiplying 26 by 4 gives 104s. The sum is 9m 44s. As the place is west of the standard meridian, this 9m 44s must be subtracted from the standard time to get the LMT of birth. The nearest S.T. given in Dalton’s table of houses to the 16h 43m 10s written on line 20 is 16h 41m 59s. The difference (b) is 1m 11s. The next nearest S.T. given in the table is 16h 46m 16s. The difference (a) between this and the nearest is 4m 17s. Subtracting log. (a) .7484 from log. (b) 1.3071 gives .5587 to be used in getting all house cusps. Adding log. (c) for the 60′ M.C. difference 1.3802 to .5587 gives 1.9389, which is the log. of (d) 17′ to be added to the 12 Sagittarius 00 shown in the table, giving the M.C. 12 Sagittarius 17. Adding log. (c) for the 1° 37′ Asc. difference for lat. 38 given in the table 1.1716 to .5587 gives 1.7303, the log. of (d) 27′ to be added to the 28 Aquarius 55 given in the table, making the Asc. 29 Aquarius 22 for lat. 38. Adding the 7′ correction for the 13′ difference in latitude between 38 and 37:47 gives the Asc. 29 Aquarius 29. The midnight ephemerides are really zero hour ephemerides with positions calculated for the midnight preceding (not following) noon of each given day. Both the LMT Interval entered on lines 13 and 17, and the EGMT Interval entered on line 26, therefore, must be ascertained as from the midnight (zero hour) preceding noon of the day of birth. This may be done merely by algebraically adding plus 12 hours to each of these two intervals as ascertained when using a noon ephemeris for the same date. The correction of Sidereal Time entered on line 19 must be calculated from the EGMT Interval from midnight entered on line 26, and added to or subtracted from, as its sign indicates, the uncorrected Sidereal Time entered on line 18. The Sidereal Time so obtained, and entered on line 20, is used to ascertain the house cusps in the ordinary way. The EGMT Interval from midnight entered on line 26 is used to ascertain the positions of the planers at the time of birth, from their positions given in the midnight (zero hour) ephemeris on the day of birth, in precisely the same manner as when using an EGMT Interval from noon with a noon ephemeris. When the time given is Daylight Saving Time, minus 1 hour is written on line 7 and subtracted from line 6 to get the Standard Time to be written on line 8 (see chart 7399 on page ). When the time given is Double Summer Time, minus 2 hours is written on line 7 and subtracted from line 6 to get the Standard Time to be written on line 8. In either case when the Standard Time has been ascertained, proceed to erect the chart for this Standard Time of birth in the customary manner. Subtracting the A.M. 11h 36m EGMT of line 25 from the noon of line 24 gives the EGMT Interval of line 26 (d) as minus Oh 24m, the log. of which written on line 27 is 1.7781. Subtracting the position of the Moon on July 6, 1945, from its position on July 7, 1945, gives its daily motion (a) as 14° 13′, the log. of which is .2274. Adding log. (a) .2274 to log. (d) 1.7781 gives 2.0055 which is the log. of (d) 14′ which the Moon has moved during the 24m. 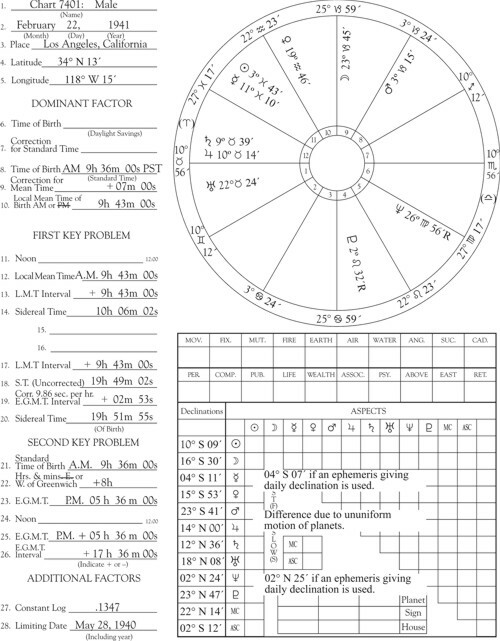 Subtracting 14′ from the noon ephemeris position of the Moon gives its birth-chart position as 17 Gemini 57. Use the daily motion of each planet as (a), add its log. to log. (d) 1.7781, and subtract the travel so obtained (b) from its noon ephemeris position. When the Standard Time Zone is East of Greenwich the correction for mean time on line 9 is plus if the place is east of the Standard Meridian, and minus if west of the Standard Meridian, the same is if the place were in a Standard Time Zone west of Greenwich. But when the Standard Time Zone is east of Greenwich the number of hours which it is east of Greenwich should be written on line 22 preceded by minus. As Central Europe Time is 1h east, the 1h written on line 22 is preceded by minus, and when subtracted from line 21 gives 5h 00m 00s P.M. on line 23, and plus 5h 00m 00s on line 26. When the declinations are given only every third day, find the daily motion by declination by dividing the 3 day motion by 3. Use this to find the declination at Greenwich noon on the given day, and the log. (a) of the daily motion added to log. (b), written on line 27, to find log. (d) of its travel through interval and its declination at birth. Due to non-uniform travel of a planet, occasionally there is a difference in the declination so obtained. 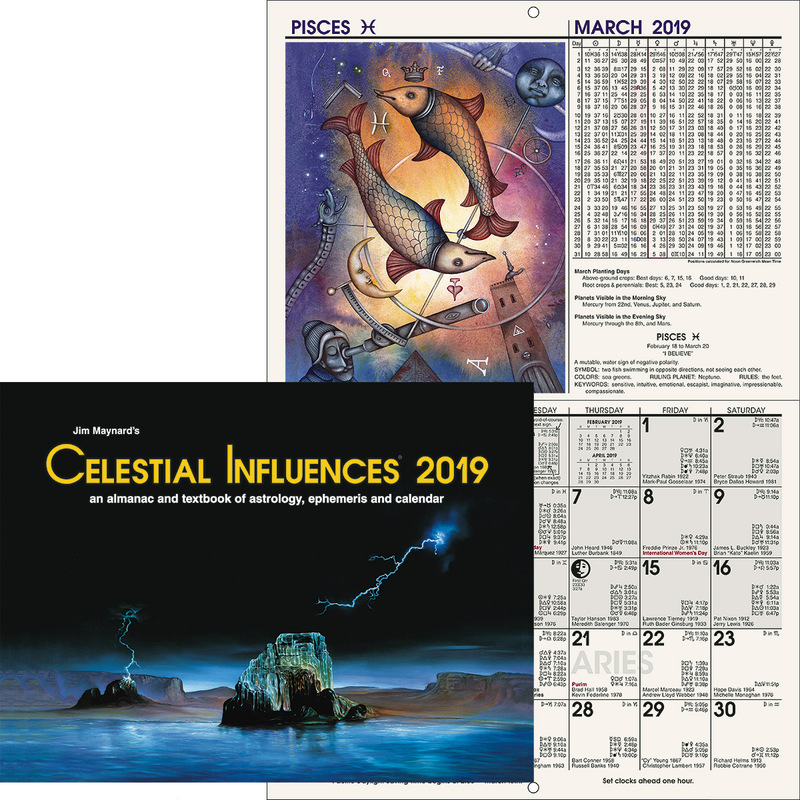 The average daily movement of Mercury by declination between March 16 and March 19, 1920, is 22′, but its motion between March 16 and March 17 is only 18′. 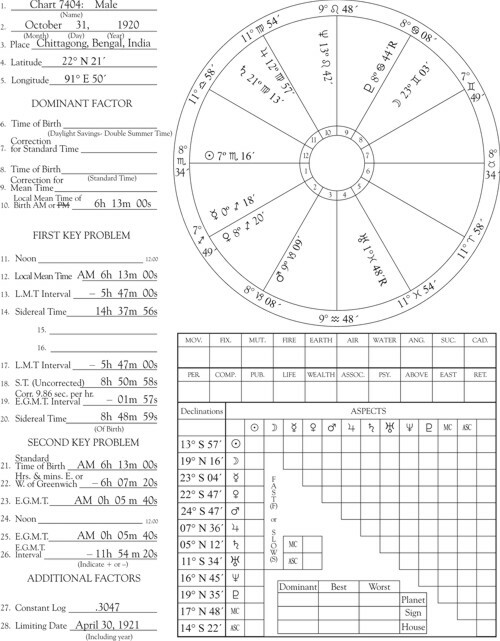 Example of A.M. Local Mean Time when place is 19:50 East Longitude: Chart 7404. When the birth is timed by Local Mean Time, write this on line 10 and on line 21. Multiplying 91 by 4 gives 364 minutes. Multiplying 50 by 4 gives 200 seconds. The sum is 6h 7m 20s to be written on line 22. As the place was east longitude it should be preceded by minus. If it were west longitude it should be preceded by plus. House cusps are calculated from line 20, and planets from line 26, in the ordinary way. House cusps have same declination as Sun when in same sign, °, and ′. Therefore, find declination of Sun in 9 Leo 48 as declination of M.C., and declination of Sun in 8 Scorpio 34 as declination of Asc. August 2, 1920, Sun 17 N 47 is decreasing (a) 15′ daily by declination. It is 9 Leo 51 and moving daily (c) 57′ by zodiacal longitude. The difference between 9 Leo 51 and 9 Leo 48 (M.C.) is (d) 3′. Multiplying (a) 15 by (d) 3 gives 45. Dividing 45 by (c) 57 gives (b) 1′ to be added to 17 N 47, giving the declination of M.C. 17 N 48. November 1, 1920, Sun 14 S 26 is increasing (a) 20′ daily by declination. It is 8 Scorpio 46 and moving daily (c) 60′ by zodiacal longitude. The difference between 8 Scorpio 46 and 8 Scorpio 34 (Asc.) is (d) 12′. Multiplying (a) 20 by (d) 12 gives 240. 240 divided by (c) 60 gives (b) 4′ to be subtracted from 14 S 26, giving the declination of the Asc. 14 S 22. For south latitude both the Sidereal Time written on line 20, and the EGMT Interval written on line 26 are ascertained exactly as if the place were in north latitude. The planets’ places are calculated from the EGMT Interval written on line 26 exactly as if the place were in north latitude. But for obtaining the house cusps from the Sidereal Time written on line 20, 12 hours must be added, using the degrees and minutes on the house cusps found from the Sidereal Time thus obtained, but placing signs opposite to those thus indicated on the house cusps. Chart 7405 has 5h 03m 19s found in the ordinary way written on line 20. Adding 12h gives the Sidereal Time as 17h 03m 19s. Calculating the house cusps in the ordinary way gives 16 Sagittarius 57 on M.C. and 10 Pisces 15 on the Asc. But instead, the same ° and ′ of the opposite signs must be used, giving 16 Gemini 57 on the M.C. and 10 Virgo 15 on the Asc. The minor house cusps are handled in the same way. Chart 7406 has 1h 57m 05s found in the ordinary way written on line 20. Adding 12h gives the Sidereal Time as 13h 57m 05s. Calculating the house cusps in the ordinary way gives 1 Scorpio 25 on the M.C., and 11 Capricorn 17 on the Asc. Using opposite signs gives 1 Taurus 25 on M.C. and 11 Cancer 17 on Asc. Minor house cusps as shown.